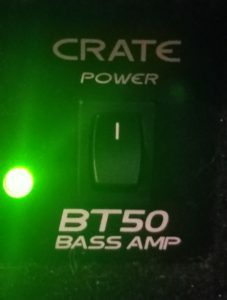 Crate BT50 Bass amp | Gear Acquisition Syndrome!! Sometimes fate has a way of smiling on you when you least expect it. And sometimes… it smiles with GEAR. 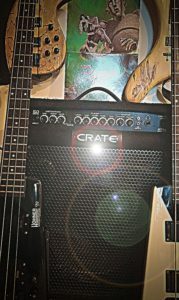 My example is the Crate BT50 bass amp. It came to me kind of on accident, from checking out an ad for something else in Craigslist. Now, my Live Room will never be the same. I’d been searching for a good deal on a Telecaster-type guitar for a couple years, when one weekend I saw one, in good shape, listed by an owner in my area. But they not only wanted to get rid of the guitar; they had a few other pieces they wanted gone too. The whole kit and caboodle of equipment they put it up at one exceptional price, and even put “Or best offer” to top it all off. Well, if you’ve hung around here long enough, you know I’m a gear nut, so the chance to investigate some really fine equipment at a low cost sparked my wires immediately. I was soon handing over my hard-earned cash to the owner and driving home with the new, groovy booty! Full disclosure here: I’m a tube amp guy. Always have been, since I was a teenager. I think that’s mostly because when solid state amps first came out, I thought they sounded SO fake, and SO plastic that I wouldn’t go anywhere near them. I always thought the same about Crate. And since they went out of business in 1997, I figured it was because we all thought they sounded like the south end of a northbound Alpaca. I’ve also heard from a repair guy who calls their amps “Cold Solder Joint Crates”, as they’re frequently brought in with that electronics problem. That’s probably still true to a large extent, but my mind has changed on one thing: there IS a place for solid-state amps in the studio. My non-deliberate acquiring of this amp (my first solid-state EVER) has opened my eyes a bit about their capabilities, and, depending on what it is you’re trying to sound like and deliver, it just might be an asset to your axe-enhancing arsenal. So, am I no longer a tube amp guy?? Hardly. I still think tube amps are the sizzle in my scha-mizzle. But at least now I know… there’s more than one way to groove a big bottom! Not bad at all for an amp that retailed for under $300!! I also find that it is getting a consistent 4.5 customer satisfaction rating no matter which pro audio store I check into. That also speaks volumes about this amps longevity. 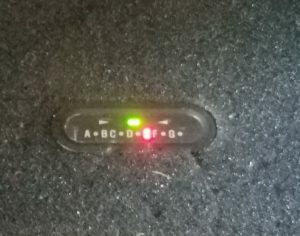 This amp is now discontinued, but I thought I’d do this article since I still see a LOT of them out there used. I know I like to read actual user’s reviews before I pull the trigger on used gear, so… here we go! I played through my tube amp first, just to wrap my ears around what the usual sound is that I use when recording in the studio. 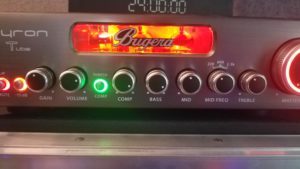 I used my Hohner Active B2-A headless bass, into my Bugera Veyron amp, going into my Ampeg 1×12 cabinet. For both amps I used the same cable, a Fender “Vintage Voltage”. Then I plugged into the Crate amp, turned it on and played my first notes. The Midrange on this amp is extremely pronounced, with all the knobs set midway. Definitely need some adjusting to take out that wonky nasality! This amp has obviously spent many a night in smoke-filled bars. Either that, or there’s an eighty-seven years old chain-smoker living underneath all that fuzzy tilex!!! I started with all the setting in the middle, at high noon. In that setting, this amp was WAAAAAY to midrangey for my tastes. I immediately turned the mids down, and adjusted the other EQ knobs too. Finally, I carved out a usable sound that I could play and record with. The settings I landed on are in the pic to the left. This amp gives a lot of definition to every note you play on this Clean channel. My tube amp gives notes a kind of luxury halo of angora warmth around all the notes, which of course I LIKE. But if you want really, really defined notes, with no fuzzy anything of any kind, this solid state amp will give it to you. 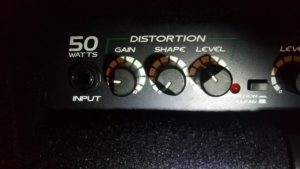 I tried various turns of the Master, versus the Level knob, but found that they didn’t give me any considerable change in tone by doing so, as other amps sometimes do. They’re just going to adjust your volumes, end of story. The Manual says there’s an internal Noise Gate, but it must not be on this channel, because I don’t hear it kicking in, no matter how soft I play and let the note fade. I think I’ll use this channel for bass on an upcoming Pop/Rock track I’ll be recording soon. I think it would work well for it, and it’ll be good to try some new bass hardware in a mix for a change. After all, pretty much everything can sound good in a mix, if it’s treated right and placed with an experienced ear. Wow. When they say Distortion… they really mean Distortion! This is NOT a subtle effect, folks. Even turned just one degree up, the notes are instantly painted with obvious, gritty growl. And when you get to nine o’clock, only a quarter turn up? It is total in-your-face SMACK DOWN! I honestly doubt I will ever use this channel, because it’s SOOO over-the-top, but I’ll say this… if you’re a Metal musician and are into that kind of tone within the constructs of your songs, this effect is MONSTER. You should definitely give it a listen. Oh, and there’s the Noise Gate! Guess they felt like they needed it on this dirty channel but not so much on the Clean. Not a bug deal though, as most of us who play out know how to keep our bass beasts tame between songs or before or after the gig. Let’s talk about this “Shape” button. It’s a weird entity. Unique, to be sure; I’ve never encountered anything like it before. Knob all the way left: This has the most bass frequencies, and also has a noticeable compression circuit on it. Knob at high noon middle: This setting is the least compressed. You can play quiet, and loud, and clearly hear the difference between them. 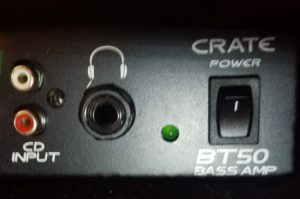 Knob all the way right: This setting gets rid of pretty much all the bass frequencies, and you’re left with a setting that could work very well if you wanted to do a rippin’ bass solo, complete with distortion. 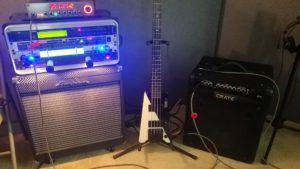 If the psyche of Eddie Van Halen suddenly took over your bass player mind, you’d want this setting. Ok, I love, love, LOVE the fact that not only is there a built-in TUNER, but that they put it ON TOP of the amp so it’s clearly there to see when you’re standing up playing. Way to go, Crate – you win the Mod of the Day Award!! It works well too. 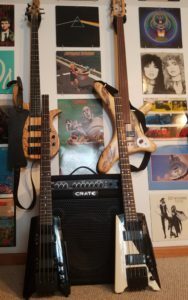 By using the tuner, my bass sounded very well-tempered and right on pitch. It’s also great that it’s a CHROMATIC tuner, not just a 4-note jobbie. For bassists that play in alternate or drop-down tunings, this is a real asset. Next, I have to say that I’m also now a fan of the OCTAVE Control now, because of this amp. How cool! The dial allows you to seep in tones one octave DOWN from whatever you’re playing. I’ve seen this effect done with pedals before, but I’ve not seen it built into an amp. And it works really well too. Pretty sweet! You can have the effect brash and obvious, but I found I liked it at about eight o’clock – barely on. This gives you enough that you can hear it when you play very high up the neck, but down in normal positions where we have to riff most of the time it’s too subtle to hear. But you felt it! YESSSSS!! I found the CHORUS to be quite good-sounding, actually. A real compliment to the sound, no matter what setting you put it on. The Reverb, on the other hand, sounded a bit “meh”. Not very convincing or flattering. More of a fake effect than giving it a true “room presence”. 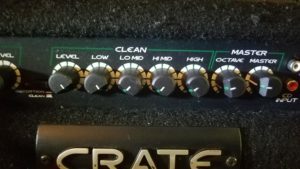 Still, if you want some depth to your tone, you can dial it in so you can just barely hear it and the quality (or lack thereof) won’t be as obvious. The sound of this amp is soooooo completely different from my higher-end bass tube amp, but I’m actually glad – now I have a fresh variation of bass timbres to throw into whatever song calls for it. Having more options is always a good thing, right?! Clean channel? Very good, IF you EQ it right and don’t mind a very defined, solid-state sound. Distortion channel? So in-your-face, you’ve got to really like that kind of delivery to choose it for anything. I’m using this amp in my Live Room now, where I and other musicians practice or rehearse for a show, and it’s a good fit. It has enough volume (if the settings are right, avoiding compression) and you can dial in a good workable tone. Sure, it will never lose that solid-state-construction sound, but that’s okay. Horses for courses.